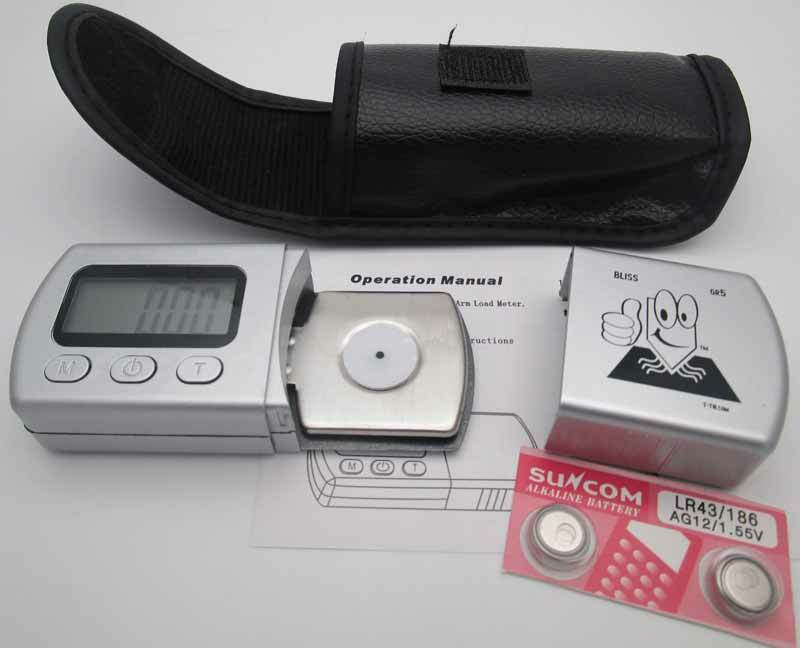 Digital Stylus Force Scale Gauge Jr.
17 points can be awarded to your webstore account (see FAQ). With our "GrooveForce GR5 Tracker Jr." electronic digital stylus force/pressure gauge you will never doubt your actual stylus tracking pressure again! While adjusting your counter-weight is good and necessary, there are several variables that cast doubt about the actual amount of pressure the diamond tip is exerting on the vinyl. Not the least of which is operator unfamiliarity. Additional factors such as a new cartridge of a different weight, & how far the cartridge sticks out beyond the headshell can also make you wonder what is really happening at that tip. Armed with precise information, one can keep notes as the stylus tip goes thru it's life cycle, you can confidently know when it is time to replace the tip without having to try to learn what it should look like under a microscope. A jeweler's loop is not enough, you must have experience under a special microscope with side lighting to really properly see tip wear. But, by taking a 'baseline' reading when you 1st setup your stylus and then checking the tracking pressure with your digital gauge as soon as you notice a problem that is not fixed by cleaning the tip, you can then gauge if a big jump up in tracking pressure is necessary to continue 'proper' playback. When this happens, your finely polished diamond tip is on it's way to becoming, well basically a chisel dragging through your grooves. By replacing the needle not too soon & not too late you will confidently know when to invest in a new needle and also not be chiseling out your records for a while until it becomes completely obvious to all that it's time to replace the needle. Video of product below is of our main digital stylus force gauge listed here. Same principles apply. I really like this item i have used it on a lot of different tables and it works great, you can dial the stylus down force right where you want it . Wish I had one of these 30 years ago. These are really nice to use in setting stylus pressure. In fact after using it once I cannot imagine installing new stylii without using it. For the price the device is truly worth it. Very pleased with it. Digital Stylus Force Gauge Jr.
Glad I bought this from TurntableNeedles.com. This is a great tool to have at your disposal (especially if you change things up or have several turntable/cartridge combos). It works great for me and is very easy to calibrate. The display is bright and easy to read. The cover seems to work good too. I'm not sure why you would spend more for the others that are available, unless it makes you feel better when buying familiar brands. I've always been concerned how precise the balance weight scale is on my old turntables. Toyed with buying this for several months and after finally doing so, I'm very happy I did. Takes all the guess work out of it and validates the exact pressure that I'm wanting. I bought this because the ancient Shure pivot balance gauge I have would not work on moving coil cartridges because the stronger magnets were attracted to the balance arm. No problem with this electronic guage. Can't beat it for the price. Great being able to know exactly what your tracking force is instead of guessing. This item worked great! After watching the YouTube video provided, I calibrated the weight of my tone arm easily and quickly. It was spot on already. Great way to check that your counter weight is correctly marked. I was a bit disappointed that there was dealer graphics printed on it which made it feel like a giveaway, but I don't think I'll need to use it that often. If you're calibrating your turntable, get one of these. The right price! Thank you. I have a phono cartridge collection and two Technics turntables which makes rotating cartridges easy. I had been managing tracking forces with a pair of Shure balance scales and was curious about how close they measured to each other and how close an electric scale would match to them. After the digital scale's quick arrival and set-up, I put a 1.5g tracking-force cartridge on both my Technics turntables with the Shure scales, and both cartridges then measured in at 1.6 grams on the new digital scale. To me, a tenth of a gram difference is pretty close between two different tracking force systems. 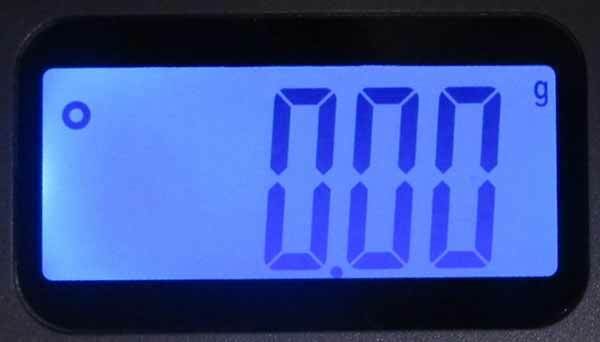 As for the Digital Scale Jr., it's easy to calibrate and use, and I'm confident it will be around to use for a long time, as long as the battery holds up. It is actually a nice little unit which costs less than Shure's gravity-driven balance scales, and with Shure thumbing it's nose at the cartridge business you have to wonder how long it's cartridge support hardware will be available. This clever little device, unassuming in appearance, is easy to use and both accurate and precise in measurement. I confess it took me a while to figure out how to remove the cover of the scale. It wasn't obvious and the instructions were silent on it. One grasps the right side of the case from above with index finger and thumb, then slides it straight out to the right. I compared stylus force measurements of the scale against other gauges I own and found the numbers to be spot on. Highly recommended. SFG-4 Digital Stylus Force Scale Gauge Jr.
Got mine last week, very simple to use and accurate. Well worth the price. Stylus Force Gauge Jr. Lightweight plastic version of the brand-name tools that do the same thing. I found my tone arm pressure was about 50% more than indicated by the adjuster knob. Well worth the price to correct that with first use. If you like tools that are heavier and will withstand abuse, pay more for something else. This does the job. Best bang for the buck scale on the market. Numbers were bang on. Easy to setup. Packaging and shipping was excellent. Highly recommended. Love the scale, very quick service and delivery.always a pleasure. Good tool for the money. Proved the counter weight system with tracking force manual adjustment on my 80's turntable is accurate. As I use several cartridge combinations this tool makes it easier to make changes. The built in stylus gauge on my Philips AF-887 was broken and I was updating my 30+ year old turntable with a new cartridge and needed to set the stylus force. The digital force gauge works great and is very easy to use. I know I will get a lot of use out of this device. Works as it should. Nice price! This scale worked perfectly Low price, but easy to use - zeroed the scale, rested the stylus and got the tonearm tracking weight and it was right on the nose. Good peace of mind when looking at an old turntable rescued from the garbage! Turntable Record Digital Stylus Scale Gauge Jr. Excellent and accurate. I am satisfied with item and price is right. Works well. Seems kinda cheaply made, however it does what its suppose to do. Goes up to 5g, which is overkill for what I need. Comes with a nice soft vinyl/leather case. Free batteries are A nice plus. 1 Comes with compact leatherette case. May Ship with our website logo on the cover.